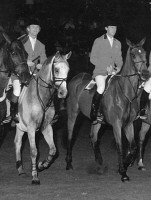 Michael Matz (right) once rode against Rodney Jenkins and on teams with him in the show jumping world. Now these two horsemen have used their experience to become successful race horse trainers. Photo by Winning Photos. After watching Union Rags win the Belmont Stakes (N.Y.), I listened to trainer Michael Matz speak to the press about the race. I wondered why Matz, who rode on three Olympic show jumping teams, earned team silver in 1996, and was inducted into the Show Jumping Hall of Fame for his many, many accomplishments, made the switch from show horses to race horses. My thoughts wandered to another great rider, Rodney Jenkins. He dominated the horse show circuit for 30 years in the hunters and jumpers before hanging up his spurs to train race horses. Did their riding and showing experience give them an advantage? I decided to see what I could learn. When I caught up with the former competitors, they were kind enough to share their experiences and reflect on what ties all horse sports together. Michael Matz: I worked at a farm, and I first did it to keep my job. My boss asked if I rode, and I said yes, but I didn’t. Riding became more challenging, and one thing led to another. I joined the Pony Club and then started showing. Rodney Jenkins: I rode as a kid. I loved horses from the start. My dad was a horseman, we hunted, and I grew up with horses. What were the highlights of your showing career? Matz: The Olympics. I really enjoyed the international competitions in Europe and the Pan Am Games. Jenkins: I enjoyed the Pan Am Games. I always wished I could ride in the Olympics, but I was a professional since I was a teenager, so I couldn’t. I just enjoyed every part of showing, and I loved jumpers the most. It was cut and dry—you get there first, you win; you don’t, you lose. What motivated you to switch from show horses to training race horses? Matz: I was getting too old to compete, and I didn’t want to give riding lessons or buy and sell horses, so I tried training race horses. I went from being in the top 20 echelon to the bottom. It was a challenge. Jenkins: I was getting older and looking for an alternative to showing after I retired. Racing was a hobby, and I enjoyed it. I didn’t want to teach, and I liked jumping, so I tried steeplechasing first but didn’t like that you only had a few starts a year, so I tried flats. Do you think people who showed and rode horses have an advantage training race horses over those who never rode? Matz: You use your experience to deal with whatever comes up. I like a horse to be well taken care of and look good. A horse that looks good usually feels good and performs to the best of his ability. A good horseman pays attention to detail. Jenkins: I think showing gives you a perspective on soundness and care. I like a horse to look good and look the part. Show stables have good feed programs, and I carry that over into my racing stable. Do you look for different characteristics in a race horse compared to a show horse? Matz: Heart is the most important in both. It’s harder to judge a race horse. I look for an athletic horse. Soundness is another main factor, but they can either run, or they can’t. Jenkins: Competitiveness. With a race horse, it’s simple: They can either run, or they can’t. Your job is to take care of the horse, and they do the work. But with jumpers, the rider can help the horse more. Good horses come from everywhere, but I think most good horses have good minds, too. I look at conformation and soundness. I like a horse with scope, not a small quick horse that can only work fast at the sales. Soundness is an A+ ingredient. I prefer to buy yearlings rather than 2 year-olds at the sales. Horse racing has gotten some bad publicity in the mainstream press. What are your thoughts about the future of racing? Matz: I think the media focuses too much on Lasix, which is an aid for the horse, rather than focusing on illegal, designer drugs. I think the penalties should be enforced and stiffer. Jenkins: Lasix is a medication to help horses that bleed. We give it to help the horse. I think the press has overworked this issue. Trainers love their horses, and most take good care of them. Thoroughbreds love to run. When they don’t run, they don’t thrive. Thoroughbreds were bred to race, not just graze like wild mustangs out west. I’m based at Laurel (Md. ), and I think they do a great job. It has a great track surface and a good turf, and the purses are getting better. Are there any rules of racing you’d like to change? Matz: I think there should be one governing body. Now, all the tracks are different. Medication rules are different, licensing rules are different, and it’s all very confusing. The rules should be the same everywhere. Jenkins: There should be one set of rules nationally. If I race in New York or Maryland or Delaware, the rules should be the same. How many horses do you have in training, and where are they stabled? Matz: I have about 50 horses in training at Fair Hill (Md.). We can turn the horses out and ride cross-country, and the horses are relaxed and content there. We do have to ship to race though. Jenkins: I train 40 horses here at Laurel (Park). I train here all year, and I send my lay-ups to my son, Patrick, at Montpelier (Va.). To what do you attribute your successes? Matz: Working hard. We do what’s right for the horse and do the best we can. We don’t overlook any details. Good horses make good trainers. I feel we get rewarded when we do the right thing for the horses, and I’ve been fortunate to have good owners who feel the same. Jenkins: My dad got me involved with horses, and I wanted to ride, and I loved it from the start. It takes a lot of hard work and discipline. A lot of luck is involved with the sport of racing. Showing gave me perspective on soundness and care of the horse. I enjoy watching young horses come along. You hope you have a good one, but most of the time, you don’t. Horses are amazing animals; they overcome a lot. Author Patti Reed grew up in Pennsylvania and showed horses. She kept horses at All Around Farms and at Rodney Jenkins’ Hilltop Stable in Orange, Va. She worked for an equine veterinarian for 18 years at race tracks and sales on the East Coast, and she owned and bred several race horses that raced in Pennsylvania. She’s written articles for the Thoroughbred Times, Backstretch and Western Horseman.